What is an Alaska Eviction Notice? Alaska Eviction Notice: What Is It? An Alaska eviction notice is a form used by landlords and property management companies to inform a tenant that they’ve broken their lease in some way. For most lease violations, the tenant is given a certain amount of time to correct the violation to avoid being required to vacate the premises. An Alaska eviction notice is often called a notice to quit. What Are the Components of an Alaska Eviction Notice? Before we discuss the components for each of these, let’s first briefly discuss the two ways that lease violations are categorized: curable and incurable. A curable lease violation means that the tenant has a certain number of days to correct the problem to avoid eviction. An incurable lease violation means that the tenant must vacate the rental property (and remove their belongings) within a certain number of days. All Alaska eviction notices must comply with the landlord-tenant laws of the state. A 24-Hour Notice to Quit is used when the tenant deliberately and maliciously damages the rental property in some way and that damage is worth at least $400. It means that the tenant has 24-hours to vacate the property. These eviction notices must abide by AS 34.03.220(a)(1). The legal name of the tenant(s) responsible for caring for the property as listed in the lease. The name of the landlord. A description of the deliberate and malicious damage done to the property. The address and telephone number of the landlord. A certificate of service that explains how the landlord served the notice to the tenant. The certificate of service must also be signed by the landlord. A 5-Day Notice to Quit is used by the landlord if the tenant is caught in the midst of illegal activity on the property or if the tenant is suspected of doing such. Illegal activities are considered nuisances under Alaska law. Depending on the circumstances, illegal activity may qualify as a 24-hour notice to quit. Illegal activities are generally considered an incurable lease violation. The name of the tenant(s) bound by the lease agreement. A description of the illegal activity that took place or is suspected as happening on the rental premises. The printed name and signature of the landlord. A certificate of service that lists the date the tenant was served as well as how they were served. Non-payment of rent is generally a curable lease violation. If the tenant pays their rent within seven days, they will not be required to leave the property. It is very important that the landlord explain in the notice that the tenant has the choice to move or leave the property. If the tenant pays after the seven days are up, the landlord may decide whether to accept the rent or to continue with the eviction. An Alaska eviction notice for non-payment of rent must comply with AS 34.03.220(b). The legal name of the tenant(s) required to pay rent. The amount of rent owed to the landlord. The date and time by which the rent must be paid. The printed name of the landlord. This particular Alaska eviction notice is used with curable lease violations other than non-payment of rent. Tenants have 10 days to correct the violation or vacate the property. However, if the tenant violates the lease again in the same way during the next six months, the landlord is legally allowed to send a 5-day notice to quit instead of a 10-day notice. This eviction notice must comply with AS 34.03.220(a)(2). 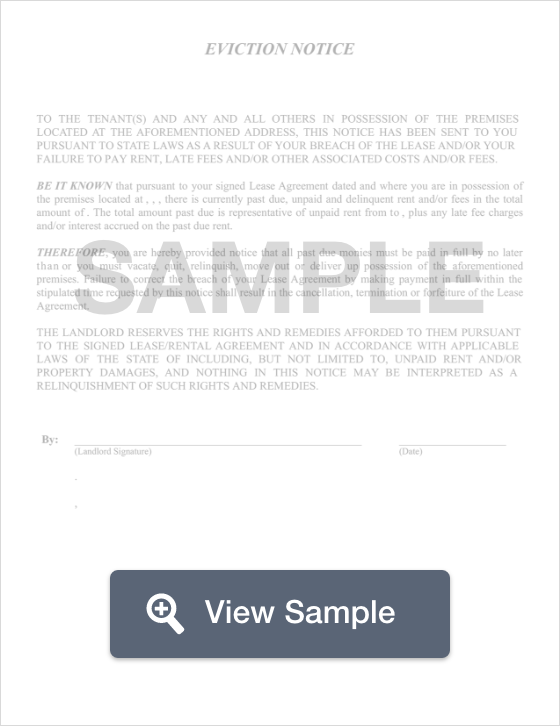 The legal name of the tenant(s) bound by the lease agreement. A description of the lease violation. The contact information of the landlord. A certificate of service that lists the date the tenant was served and how they were served. A 30-Day Notice to Quit can be used in Alaska to terminate a month-to-month tenancy. It acts as written notice to inform the tenant that the landlord does not plan to renew the lease agreement at the end of the month. This notice must comply with AS 34.03.290. It is not considered an eviction. The legal name of the tenant(s) that are party to the lease. The date the notice was created. The date that the lease will terminate and an explanation that the notice is being used to explain to the tenant that the month-to-month agreement will not be renewed. What Are the Legal Considerations of an Alaska Eviction Notice? Alaska eviction notices must comply with the landlord-tenant laws of the state. It’s important for landlords to note that an eviction notice is the first step that must be taken and that a forcible entry and detainer lawsuit cannot be filed unless the proper eviction notice was drafted and served. Evictions must be legal in nature. In Alaska, an unlawful eviction could include changing the locks, taking the belongings of the tenant, removing the doors, turning off the water, turning off the electricity, turning off the gas, retaliatory evictions, or evictions for discriminatory reasons. For more information about what may be considered an illegal eviction in Alaska, contact a landlord-tenant lawyer in your county. It’s important that landlords issue the proper eviction notice and abide by the time frame set by Alaska law. For your convenience, we’ve linked to various laws above as well as listed the number of days required for the most common eviction notices used. Eviction notices must be served in accordance with landlord-tenant law. Service options include certified mail, hiring a private process server, or the landlord may personally serve the tenant. While personally serving the tenant may seem like an economical choice, it’s not necessarily the best option. Evictions can get heated, especially if they involve an incurable lease violation. They can cause people to act in ways they may not usually act. If you were served with an Alaska eviction notice, read it carefully. First, determine why the notice was served. Second, determine if you’re being given a certain amount of time to correct the issue. For example, if you were served for non-payment of rent, the notice should include how much you owe and the date by which the past due amount must be paid. If you have questions, contact the landlord. Remain calm. Understand that if you are actually evicted, it could make it hard for you to find housing. If you’re sued in court, that could affect your credit. You also have the option to contact a lawyer who practices in this area and get your questions answered in that way. If you cannot afford a lawyer, look for legal clinics and legal aid offices that may be able to help you. Personally serve the tenant. Make sure that you complete a certificate of service. You should also remember that this has the potential to put you into a dangerous situation. If you do not serve the tenant, you cannot legally evict them or file a lawsuit if they refuse to leave the property. You could also be sued. Remember that all Alaska eviction notices must comply with the landlord-tenant laws of the state. We’ve linked to those laws for the most common forms of eviction. If you have additional questions about eviction notices, contact a landlord-tenant lawyer.